Though some scary parts may make the very young fret unduly, the film also puts forward some thoughtful messages for both children and their parents. 101 min. Walt Disney Pictures. Directors: Andrew Stanton, Lee Unkrich. Cast: Albert Brooks, Ellen DeGeneres, Alexander Gould, Willem Dafoe, Brad Garrett. Computer-animation giant Pixar scores again with Finding Nemo, an amusing tale which will no doubt please all ages. Following in the admirable footsteps of Monsters, Inc. and A Bug's Life and the prodigious shadows of Toy Story and Toy Story 2, Finding Nemo proves that, to date, Pixar can do no wrong with its formula of character comedy and spectacle. Finding Nemo tears through its tear-jerking Bambi-style backstory to arrive at its single-parent family: a clown fish named Marlin (voiced by the ever-neurotic Albert Brooks) and his spunky son Nemo. On Nemo's first day of school, a doozy of a plot-crisis separates Nemo from his father. The story starts slowly with some flat Borscht-Belt-meets-Disney humor but becomes increasing exhilarating as relationships evolve and plot complications compound. Developing twin storylines of Marlin's search-and-rescue and Nemo's attempted Mission: Impossible-style escape from far-flung incarceration, writer-director Andrew Stanton puts the emphasis on adventure. The silver-tongued voice cast includes Willem Dafoe, Geoffrey Rush, Barry Humphries, Brad Garrett, Allison Janney, Austin Pendleton, Eric Bana, Stephen Root, Vicki Lewis, Elizabeth Perkins, John Ratzenberger, and Stanton himself as a surfer turtle named Crush. Brooks plays the straight(er) man to Ellen DeGeneres's very funny, guileless but wacked-out Dory. A regal blue tang with short-term memory loss, Dory tags along with Marlin on his hunt for Nemo. Stanton and the Pixar team picked the most literally and figuratively colorful of marine life to showcase. One might surmise that the computer-animated Pixar style is perhaps better suited to the plastic characters of Toy Story and the unreal world of Monsters, Inc. than the organic environs of A Bug's Life and Finding Nemo, but after a brief period of acclimation, each film insinuates its unique charms. Last year's hand-drawn Spirit: Stallion of the Cimarron flaunted some beautiful animation of wild horses, but was as boring as dirt. Finding Nemo capitalizes on the ethereal beauty under the sea, as well as Pixar's talents of design, movement, and action. Though some scary parts may make the very young fret unduly, the film also puts forward some thoughtful messages for both children and their parents. Nemo resents his father's overprotectiveness at first, just as Marlin quickly chafes at Dory's spacy, puppy-like enthusiasm. But Marlin learns to give Nemo judicious freedom, to recognize Dory's love and talents, and to live a little himself, despite his neuroses. Fear not, parents: kids will also intuit (without an "I told you so" rebuke) that Marlin was right to warn Nemo of the life-threatening dangers of the deep blue sea. BONUS ALERT: Don't show up late, or you'll miss the short film "Knick-Knack," a cute trifle about an enterprising snow globe with original music by Bobby McFerrin. 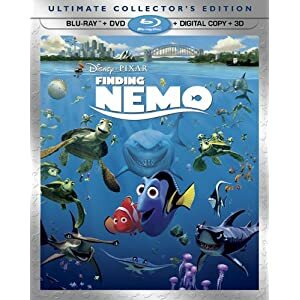 Disney continues to impress with its hi-def output, as with its five-disc Ultimate Collector's Edition Blu-ray 3D/Blu-ray/DVD + Digital Copy combo pack of Finding Nemo. With its Blu-ray 3D transfer sharing a case with Blu-ray 2D and DVD and digital copies, this package offers significant bang for your buck (even those who don't have 3D yet might want to plan ahead and, um, "shell out" for this "Ultimate" version). Though the original theatrical release in 2003 was in 2D, but I'm here to tell you that this here's a very impressive presentation that piggybacks nicely on the recent theatrical 3D re-release. The 2D Blu-ray version is eye-poppingly gorgeous to begin with, especially in its lush color and razor-sharp calibration of contrast and black level (there's just a hint of banding at times in the wide open spaces). Detail is hugely impressive, and there's as much texture here as the source material has to offer. All of this visual resplendence makes its way into the 3D version, which convincingly adds depth that was always a potential element of the three-dimensional CGI character and environment designs. The film's action easily lends itself to 3D, as the characters are in constant motion, often moving towards frame, and frequent bubbles and relative placements of characters and scenic elements keep up a constant illusion of depth. The Dolby TrueHD 7.1 surround mix is guaranteed to shiver your timbers. This is audio perfection, with pinpoint precision to the balance: always clear dialogue, thrillingly lifelike sound effects, and robust, full-sounding music bolstered by a strong LFE baseline. There's a 3D exclusive bonus feature on the 3D disc: 3D HD Aquariums (HD) comprises seven high-definition virtual aquariums—Anemone, Drop Off, Jellyfish, Plate Coral, Reef, Sandy Reef, and School of Fish—that can turn your TV into video wallpaper. The first Blu-ray disc includes several new bonus features, beginning with CineExplore (HD), which repurposes the Director's Visual Commentary from the DVD into an audio commentary with concept and design art and video interviews that put the "V" in "A/V." The audio commentary participants are director Andrew Stanton, co-director Lee Unkrich and co-writer Bob Peterson. Also new is "Finding Nemo - A Filmmakers' Roundtable" (17:37, HD), with Stanton joining Pixar cohorts Unkrich, Peterson, producer Graham Walters, production designer Ralph Eggleston and technical lead Oren Jacob for a retrospective discussion about the film's making. These are always terrific, collegial, and relatively candid versus talking-head interviews, the Finding Nemo chat being no exception. Rounding out the new bonuses are "Reinventing the Submarine Voyage" (15:05, HD), about the retooling of the Submarine ride at Disneyland to be a Finding Nemo attraction; "Deleted Scene: Alternate Opening" (3:04, HD); and "A Lesson in Flashbacks" (8:00, HD), with Stanton discussing a choice in narrative structure. Also on the first Blu-ray disc: the Pixar short "Knick Knack" (3:37, HD) and Aquarium (HD), a la the 3D Aquariums. The second Blu-ray disc houses previously available bonus features, a couple of them given an HD upgrade. Aquariums (HD) reappear, just not in 3D here. "Art Review" (8:32, HD) works as a kind of annotated gallery, with three of the film's character artists discussing design choices as we see concept and design art. The solid making-of featurette "Making Nemo" (25:35, SD) returns, as does "Exploring the Reef" (7:01, SD) with the film's characters meeting Jean-Michel Cousteau. There's a playful Pixar "Studio Tour" (5:24, SD) and a section called Old School with the following snippets: "El Captitan Pitch Selects" (0:52, SD) with Stanton pitching the project; "School Progression" (0:38, SD), meaning a scene moving from storyboard to animatic; "MA Reference" (0:53, SD) pointing out all the Massachusetts allusions in the movie; "Whale Mouth" (2:19, SD), about creating CGI water for the whale sequence; "International Mine" (0:22, SD), a montage of international dubs of the film; the self-explanatory "Pelican Animation" (0:52, SD); "Glenn McQueen Tribute" (2:46, SD) about the late Pixar animator; and "Aquascum 2003" (0:32, SD) a fake ad for the Aquascum 2003 tank filter. Four Outtakes include "Chickenfish" (0:28, SD), "Dory Muttering" (0:27, SD), "Rove McManus" (0:18, SD), and "Albert Brooks Punch Lines" (0:20, SD). Seven "Deleted Scenes" include "Crush the Hippie" (1:10, SD), "Shark Volleyball" (0:51, SD), "Frantic Dad" (0:26, SD), "Scent of Lavender" (0:23, SD), "Sewage" (0:30, SD), "Prologue Bedtime Story" (0:56, SD), "and "Soap Opera / Gill Lies" (1:11, SD). "Mr. Ray's Encyclopedia" (SD) serves as an interactive guide to ocean critters. All site content © 2000-2019 Peter Canavese. Page generated at 04/25/2019 03:24:29PM.